Primorsko is situated on a small peninsula between the beautiful Bay Stamopolu and the Devil Bay. 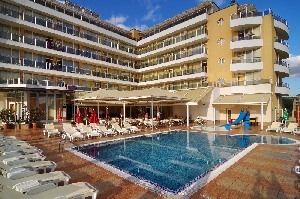 It is located 50 km south of Burgas. There is a panoramic route connecting Primorsko with all Black See cities - Kiten, Duni, Sozopol, Burgas, Nesebar, Varna and others. 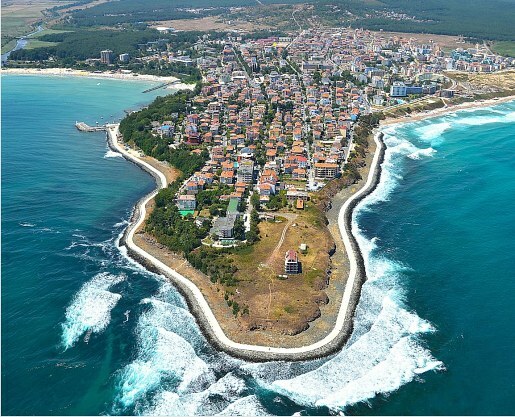 Primorsko has beautiful beaches with golden sand and picturesque dunes. The beach promenade is around 1045 sq.m. The climate is continental Mediterranean characterized with hot and sunny summer days, cool breeze and relatively high night temperatures. The middle temperature in July is 23-24 Degrees Celsius and the maximum is not more than 32 Degrees Celsius. Tourism is very important for the development of the region. There are various types of tourism – eco tourism, cultural tourism, country tourism, hunting turism.